This holiday season, give your loved ones a homemade gift that’s both practical and puts the mantra of reduce, reuse, and recycle into action! 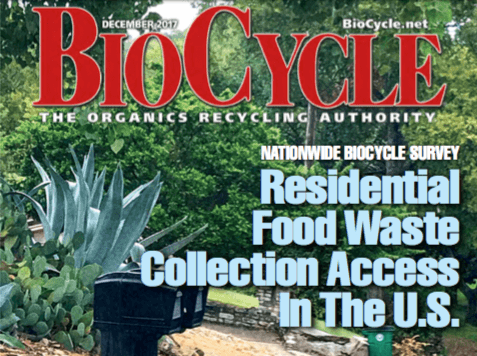 You don’t have to move to the wilderness and forage for bugs to reduce your personal ecological footprint. 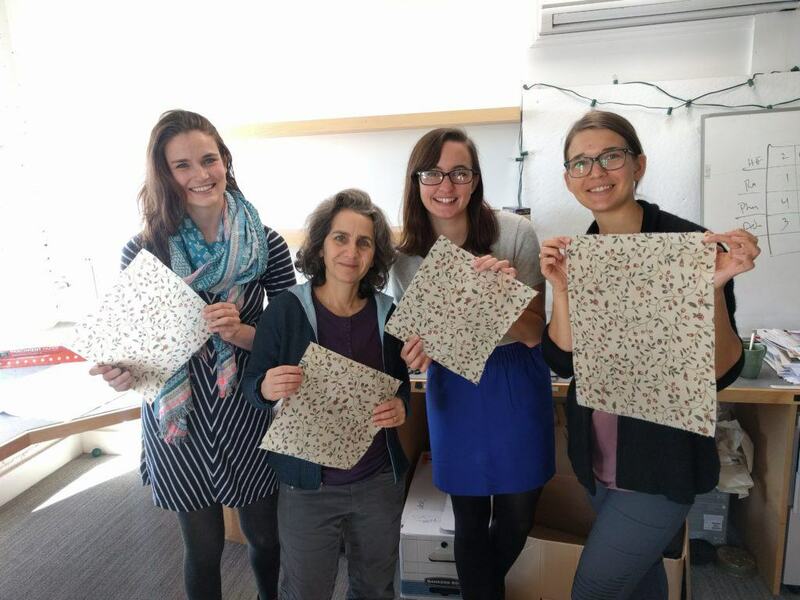 Using beeswax food wrap instead of the plastic version is an easy way to produce less plastic waste and use less our planet’s resources. In addition, making your own gifts is a great way to step out of the consumerism loop during the frantic holiday time when it’s all too easy to get sucked in, while making your loved ones feel extra special. 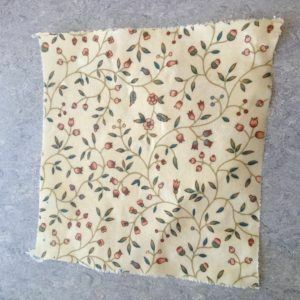 You can easily make your own natural food wrap using any extra cotton fabric you have in your closet (or find at your neighborhood thrift shop), and organic beewax. Read on to learn how to make this eco-friendly and reusable alternative to plastic wrap that’s better for your health, and hugs bowls and snacks (fruits, veggies, cheese, bread, sandwiches, etc.) with just the right amount of cling! Beeswax, either grated (smells great!) or pellets. You will need about 0.5 oz. of beeswax per wrap. 100% cotton fabric, cut to an appropriate size, such as 12×12 in. or 8×8 in. A cheese grater for the beeswax. Newspaper to cover working surface. 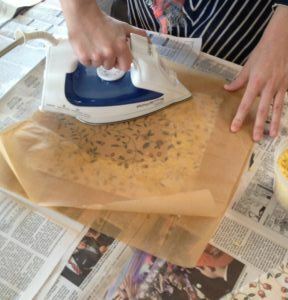 You’ll need a number of layers of newspaper if not working on a heat-resistant surface like an ironing board. 2. 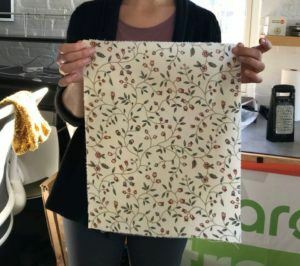 Place your pre-cut fabric on a sheet of parchment paper. 3. Sprinkle a light and even layer of the grated beeswax onto your fabric. 4. Cover with an additional sheet of parchment paper. 5. Slowly use your iron to melt the wax into your fabric, using the weight of the iron to evenly distribute the wax. 6. Peel back the top layer of parchment paper to check if the wax is melted and evenly distributed. Sprinkle more beeswax on any bare spots as needed and iron again. Make sure the corners and edges of your cloth are covered in beeswax. 7. 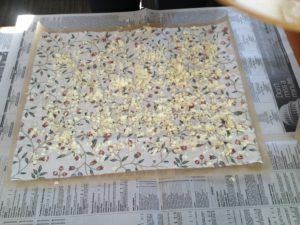 Peel the beeswax cloth from the parchment paper and let it cool on a clean, stick-free surface (such as another piece of parchment paper). 8. 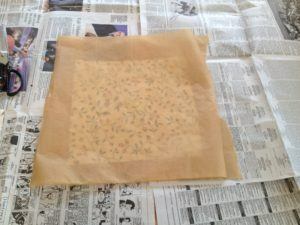 Once it dries, your first beeswax wrap is ready! 9. If you have a lot of wax left on your parchment paper, don’t waste it! 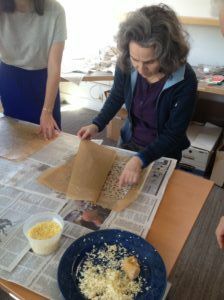 Use it to make make another beeswax wrap. Use your beeswax wrap to cover a bowl of food you’re saving for later or use it to wrap a snack. The warmth from your hands will mold the wrap into the desired shape. We do not recommend to use the wrap for meat and dairy, since you won’t want to wash your beeswax wrap in hot water. After each use, wash your beeswax wrap with cool water and mild dish soap, then allow it to dry. Depending on how frequently you use it, your beeswax wrap can last for up to a year. After that you can re-wax it or compost it.